How does America deal with a country that commits terrorism against us and then honors the terrorists? Answer: We give it billions of dollars every year as well as our most advanced military technology. The Israeli President, Moshe Katzav, in recent formal ceremonies honored the Israeli agents who made terrorist attacks against American sites in Egypt hoping to provoke an American war with Egypt. “Although it is still a sensitive situation, we decided now to express our respect for these heroes,” President Moshe Katzav said after presenting the three surviving members of the bomber ring with certificates of appreciation at a Jerusalem ceremony. In the Lavon Affair, named for the Israeli Defense Minister at the time, Pinhas Lavon, the Israeli government launched a false flag, terrorist operation against American sites in Egypt hoping to provoke American bombing, retaliation and war against that nation. The Israeli terrorists targeted American sites such as American Cinemas and American libraries around Cairo. Only the premature detonation of one of the Jewish terrorist’s bombs led to the exposure and halt of the plot before the extensive loss of life and property. If this terrorist operation would have been successful, not only would it have cost many American lives, it would have launched an American war against an innocent nation which in turn would have caused the death of many thousands of innocent American and Egyptian lives as well as untold billions of dollars. Israel’s terrorist plot against the United States in the Lavon Affair was one greatest acts of treachery that any nation has ever committed against an ongoing ally. There have certainly been many times in history where a nation attacked a supposed ally, but I know of no cases where an “ally” attacked another and then the attacked nation remained an ally and continued to support the attacking nation financially and militarily! For that to occur there has to be an incredible level of subversion in the attacked nation. And shockingly, this was only the first Israeli act of treachery against the nation that stood by Israel more than any other: America. There have repeated acts of Israeli terrorism and treachery against the United States of America. And very recently, important figures in the Israeli lobby AIPAC, arguably the most powerful lobby in Washington, D.C., are under investigation by the FBI for spying against the United States. The fact that the President of the United States and most of the members of Congress have close ties to this lobby for a foreign nation, a lobby which is now in the middle of spy scandal should obviously be a huge story in America’s press, but it is suppressed in the Jewish dominated American media. Israel knew that the U.S. Government would certainly respond to terrorist attacks against it (supposedly by Egypt) — with bombing and war against that nation. Terrorist acts of war were committed against America and traditionally nations respond to such in kind. But, once America discovered that it was Israel who committed such terrorist acts of war, why was there no military retaliation against the offending nation? In fact, American money and even military equipment continued to Israel unabated. Such shows the high level of Israeli subversion and dare I say it, treason, in the United States Government. It also clearly reveals the Jewish supremacy in the press that has whitewashed and kept this treachery from the knowledge of 99 percent of American people. In fact, 99 percent of Americans will never hear of the Lavon Affair nor will they know anything about the recent Israeli government official ceremony that honored the Israelis who committed these terrorist acts against America. For years Israel denied knowledge of the event, just as Israel denied the murderous attack on the USS Liberty, denied their involvement with the damaging spying of Jonathan Pollard, and denied the overwhelming evidence that indicates Israeli prior-knowledge of the 911 attack. (See my article, “How Israel Caused the 911 Attacks” at http://www.davidduke.com) The Israeli defense minister, Pinhas Lavon had to resign after the bungled terrorist attacks in Egypt, and the excuse was given that it was a “rogue operation.” Yet, obviously, launching terrorist attacks against United States installations in Egypt that included American cinemas and libraries, would have certainly had to have been approved by the Israeli Prime Minister at the time, Golda Meir. is receiving billions of American tax dollars every year, the lion’s share of America’s entire foreign aid budget, and the fact that America is the only major nation that defends Israeli crimes against the Palestinians in the U.N. Yet, it shows just how firmly Israel has the government and media of America in its grip that they can get away with honoring terrorists who have attacked America! How can America still support a nation that formally honors those Jews who clearly committed terrorism against the United States? Any President, Congressman or Senator that who supports sending Israel American tax dollars after the clear record of unrepentant Israeli terrorism and treachery against the United States, is equivalent to any American who sent money to the Japan after the attack at Pearl Harbor! It is important to note that no Arab or Muslim government, including that of Saddam Hussein, has ever launched a terrorist attack against America. No Arab or Muslim government has ever had even a single, highly placed spy do damage to the United States. No Arab or Muslim nation has corrupted our political process with massive bribery, threats and coercion of thousands of U.S. politicians. In truth, the Iraq War is just another form of a false flag operation like the Lavon Affair. It was spawned by Israeli loyalists in the United States, Paul Wolfowitz, Richard Perle and coterie of Jewish supremacists (including the man in charge of the evidence of Iraqi misdeeds in the CIA , Stuart Cohen, who was behind much of the false intelligence) that led America into a war against Iraq, a nation that had never harmed and posed absolutely no threat at all to America. This treasonous war was never a war for America, but only a war for Israel. It has so far led to the death of almost 1600 Americans, grievous injuries of up to 20,000 of our men and women, expenditures of a national treasure of over 300 billion dollars, damage to American business around the world, trillions of dollars in higher costs for oil and gas, and has only increased hatred against America and increased support for Al Qaeda and other anti-American terrorists. And again, for what is all this the blood and treasure lost? For Israel, that’s what, a nation that honors terrorists who bombed American facilities! My God in Heaven, when will real Americans wake up to this treachery and treason! But Israeli hoped the attacks, which caused no casualties, would be blamed on local insurgents collapsed when the young Zionist bombers were caught and confessed at public trials. Two were hanged. The rest served jail terms and emigrated to Israel. Embarrassed before the West, the fledgling Jewish state long denied involvement. It kept mum even after its 1979 peace deal with Egypt, fearing memories of the debacle could sour ties. Meanwhile, the agents locked up in Egypt were ignored, excluded from several prisoner exchanges with Israel after the wars of 1956 and 1967. Now that they have been officially recognised in Israel, the former agents are campaigning for a full account of their operation to be included in the high-school syllabus. “This is a great day for all of us, those who were hanged and those who died,” said Marcelle Ninio, the only female member of the cell. “We are happy we’ve got our honour back. The aim of the 1954 Israeli Mossad project, codenamed Operation Suzannah was to bomb United States installations in Egypt, such as the United States Information Service offices, and blame Arabs, hoping it would harm Egyptian-American ties. It became known as the Lavon Affair or the Unfortunate Affair (Hebrew: העסק הביש pronounce: haesek habish), after the Israeli defense minister Pinchas Lavon who was forced to resign because of the incident. Israeli Mossad agents from “Unit 131″ 1 planted bombs in several buildings, including a United States diplomatic facility, and intentionally left behind evidence implicating Arabs as the culprits. The conspiracy was intended to disrupt U.S. relations with Egypt but one of the bombs detonated prematurely and the Egyptian police swiftly found one of the terrorists. This arrest quickly led to the capture of eleven of the thirteen members of the spy ring. Some of the spies were Israeli, while others were Egyptian Jews recruited by Mossad. Two of the conspirators were sentenced to death and executed. Six others were sentenced to lengthy prison terms. Lavon claimed that he had no knowledge of the conspiracy and he attempted to scapegoat and fire his deputy, Shimon Peres. The Prime Minister of Israel, Moshe Sharett, appointed a board of inquiry consisting of Israeli Supreme Court Justice Isaac Olshan and the first chief of staff of the Israel Defense Forces, Ya’akov Dori. 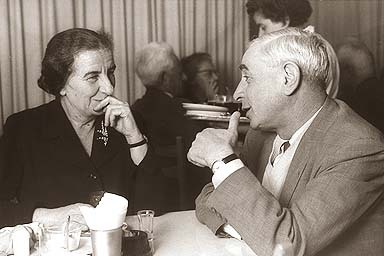 The board failed to uncover who had ordered the conspiracy yet Lavon resigned in disgrace from his position as minister of defense and David Ben-Gurion resumed the post under Sharett. Lavon became head of the Histadrut. Six years later, a district court found the intelligence operations chief guilty of perjury and forgery during testimony presented to the Olshan-Dori board of inquiry. Lavon demanded that Ben-Gurion clear his name but Ben-Gurion refused. The controversy broke out into open Knesset debates, fatally wounding the ruling Mapai Party. Eventually the Mapai Central Committee voted to expel Lavon from his position in the Histadrut. intelligence, a belief that is still popular (especially in Arab countries). The Nike symbol is known all over the world — on sneakers and on t-shirts with the words “Just Do It” emblazoned below. And more recently, in a sign of inclusivity, Nike’s swoosh has appears on hijabs in some areas, for athletes who want to cover their heads without sacrificing their competitive edge. As of today, the Nike Pro Hijab is now available for athletes worldwide. According to the company, Nike designers have been working with female athletes around the globe in recent years to prototype different hijab designs that could allow elite competitors to see, hear, sweat, and move freely without any interference, the company said today. They worked with weightlifter Amna Al Haddad and figure skater Zahra Lari, both from the United Arab Emirates, to put the garment to the test in their respective sports, as well as Manal Rostom, a Nike Run Club Coach in Dubai, and Zeina Nassar, a German boxer. And the results were clear: the world’s top Muslim athletes wanted hijabs made from lighter, softer material that would allow them to breathe, stretch, and win. 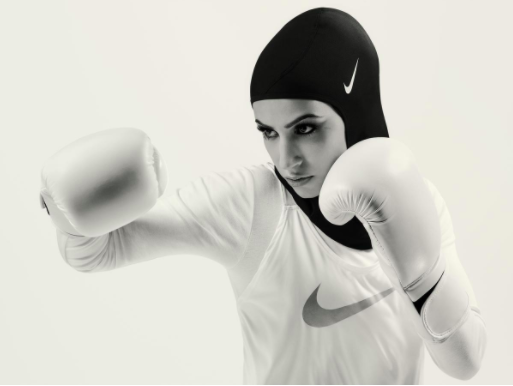 In response the company produced a pull-on sport hijab made of stretchy mesh, with holes for ventilation, and elastic binding so it fits snugly on an athlete’s head, according to Nike. American Olympian fencer Ibtihaj Muhammad, who was the first American athlete to wear a hijab in the Olympics, said that prior to using the Nike hijab she was wearing a child’s hijab made of thick material that, when it got wet from sweat, would become heavy and stiff and prevent her from hearing the referee. She lost multiple points for false starts because she couldn’t hear the officials’ calls, she told Nike. Global Citizen campaigns against discrimination by religion, gender, or any other quality, and stands for freedom and justice for all. Join us in taking action here. The hijab is for sale today in two colors around the world, with new colors coming in January.